Fathom SEO releases a new guide about Online Video Production and Marketing for businesses interested in increasing their online exposure to drive traffic, sales, leads and publicity. Online videos are fresh, new and the easiest way to engage a website visitor. It's the modern face-to-face customer meeting. While online video viewing skyrockets, many businesses are jumping on the Internet video bandwagon. What's easier than attracting new leads and sales with a snazzy video describing products or services on a company's website? Fathom SEO, a leading Search Engine Marketing firm, offers a new guide, 'The Dawn of a New Industry - Internet Video Production & Marketing,' with helpful tips for businesses considering professional online digital video production services. It details why it is no longer enough to aspire for high search engine rankings using traditional search engine optimization on sites like Google, Yahoo!, and MSN. "Online videos are essential for businesses to create brand awareness and compete in today's Internet marketplace," said Jim Kukral, author of the guide and an Internet Video Marketing Specialist at Fathom SEO. "Online videos are fresh, new and the easiest way to engage a website visitor. It's the modern face-to-face customer meeting." The free Internet marketing guide explains why online videos are important in today's Internet-driven society, as well as what type of videos might attract a potential client. Successful videos are best left to professional online video production studios that understand that it's more than just creating a video. Online videos work best with a multifaceted approach, combining video production with online marketing and distribution, the guide explains. Jim Kukral is a veteran online marketing consultant, award-winning blogger and frequent speaker at industry-leading conferences. 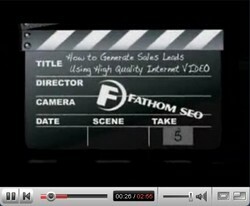 Jim leads Fathom SEO's Internet video marketing division. Fathom SEO is an ethical Internet marketing firm, specializing in organic search engine optimization, online public relations, Internet video production, link popularity building, pay-per-click advertising and opt-in email marketing.